Period:March to April and September to early November. -Full day of sightseeing in Paro and drive up the valley to Drukgyel Dzong, which once defended this valley from Tibetan invasions. Though largely destroyed by fire in 1951, its towering walls and central keep are still an impressive sight. There is a good view of Bhutan's second highest peak, Chomolhari (7,300m), from the approach road to Drukgyel Dzong. -Next we will visit Kyichu Lhakhang (7 th century), one of the oldest and most sacred shrines of Bhutan. After lunch, we drive up to Ta Dzong, originally built as a watchtower to protect Rinpung Dzong (Paro Dzong). It was re-established as the National Museum in 1968, and now holds a fascinating collection of art, relics, religious thangkha paintings, Bhutan's exquisite postage stamps, coins and handicrafts, together with a small natural history collection. We then walk down a hillside trail to visit Rinpung Dzong (built in 1646), center of the district administration and home of Paro's monk body. It is also the venue of the Paro Tsechu, held annually in the springtime. -Drive to Thimphu , the present capital of Bhutan . Just before reaching Thimphu , we pass Simtokha Dzong on the hillside above the road. This dzong, built in 1627 by Shabdrung Ngawang Namgyal, is the oldest in Bhutan and now houses the Institute for Language and Culture Studies. -Visit the imposing Tashichhodzong, “fortress of the glorious religion”, built in 1641 by the first Shabdrung and reconstructed in the 1960s during the reign of the third king. We also visit the National Memorial Chorten, completed in 1974, which serves as a memorial to Bhutan's revered third king, His Late Majesty King Jigme Dorji Wangchuck (“father of modern Bhutan”), and as a monument to peace. -Drive takes us up to Dochu-la pass (3,088m) from which there are enchanting views of high Himalayan peaks, wooded hills, and villages and farmland in the valleys below. After another two hours' drive, we reach Wangduephodrang, where we stop for lunch. We then continue on into the hinterland, crossing Pele-la pass (3,300m) and descending to Tongsa with a short stop at Chendebji Chorten en route and also visit Ta Dzong and Tongsa town. -Morning visit to Tongsa Dzong, the largest fortress in Bhutan . The foundations of this imposing edifice were laid down in 1543 by Shabdrung Ngawang Namgyal's great grandfather, and the Shabdrung himself completed the work in 1648. Both the first and second kings of Bhutan ruled the country from this ancient seat of power over central and eastern Bhutan . 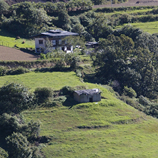 -Then proceed to Bumthang, one of the most spectacular valleys in Bhutan and also the holy heartland of Buddhism. Our journey of about 3 hours takes us up over a high mountain pass and then down through coniferous forest to our destination. After lunch we walk around the town and also visit some of the holy temples for which Bumthang is famous, including the 7 th century Jambey Lhakhang, and Kurje Lhakhang, highly revered as a meditation place of Bhutan's “patron saint”, Guru Rinpoche. -After breakfast Yatara Adventure transport will take us up to the starting point for our trek, just beyond Kurje Lhakhang. Our trail runs upstream along the Chamkhar Chu, a river known for its richness in trout. We camp overnight at 3,120m. -Walk through dense forests of spruce, hemlock, cypress, juniper and maple trees. The trail is rather muddy and ascends gradually to our campsite at 3,160m. -The path ascends gradually through dense vegetation to Tshochenchen (3,400m) where we camp overnight. 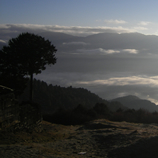 -Trek uphill from Tshochenchen to Juli-la pass (4,400m). On a clear day, there is a good view of the surrounding mountains from here. After crossing the pass, we walk downhill till reaching our campsite at 3,300m. Musk deer, Himalayan bears and blue sheep may be seen en route. -Relax in the hot springs or hike around the camp area. -the trail follows the Chamkhar Chu, descending gradually to Dhur village, where Yatara Adventure transport will meet you and drive you to our Bumthang lodge. Leisure time after lunch. -Exploring Bumthang valley, visiting Jakar Dzong and Tamshing Lhakhang. -Visit the impressive Wangdue Dzong, situated at the junction of the Mo Chu and Tang Chu rivers, and also take a stroll around the market area visiting local shops. -Drive to Bhutan's old capital Punakha to see Punakha Dzong (1637), a superb example of Bhutanese architecture. Damaged over the centuries by fire, earthquake and floods, the dzong has in recent years been superbly restored. -Drive to Paro, where we will have time for sightseeing in town and also a visit to a traditional Bhutanese farm house, to gain an insight into the lifestyle of the local people. If you do visit Bhutan, you will become one of the few who have experienced the charm and magic of one of the world’s most enigmatic countries – the ‘last Shangri La’ . © 2018 Copyright Yatara Adventure.All rights Reserved.